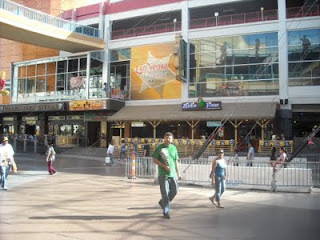 Locate on the second floor above Hennessey's Tavern and Mickie Finnz on Fremont Street is a country western bar. It is called the Las Vegas Country Saloon. Inside there is a dance floor, stage and a mechanical bull. All you need for a country western bar. They have live music and a DJ. Depending on what night you are there. They open at 8:00 pm. The location is just west of Las Vegas Blvd. and just east the Fremont Street Experience.